Well, the polls are closed, the votes are counted, and we have our winners for the very first Fort Fido Howl-O-Ween Costume Contest! There were a lot of great costumes, and I'm really glad that you guys decided to share them all with us. First place was taken by the illustrious Captain Riley! Who can ever resist a gorgeous pirate? 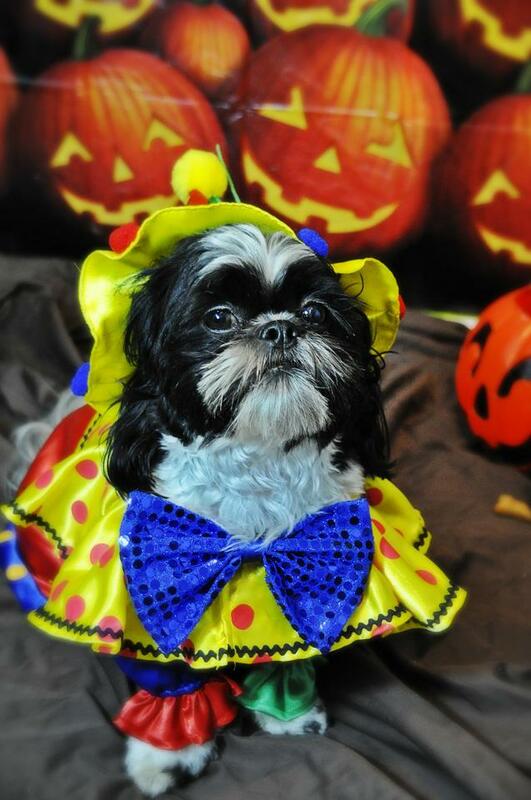 Third place is our Buddy Boy, who got all snazzy in this adorable clown getup. 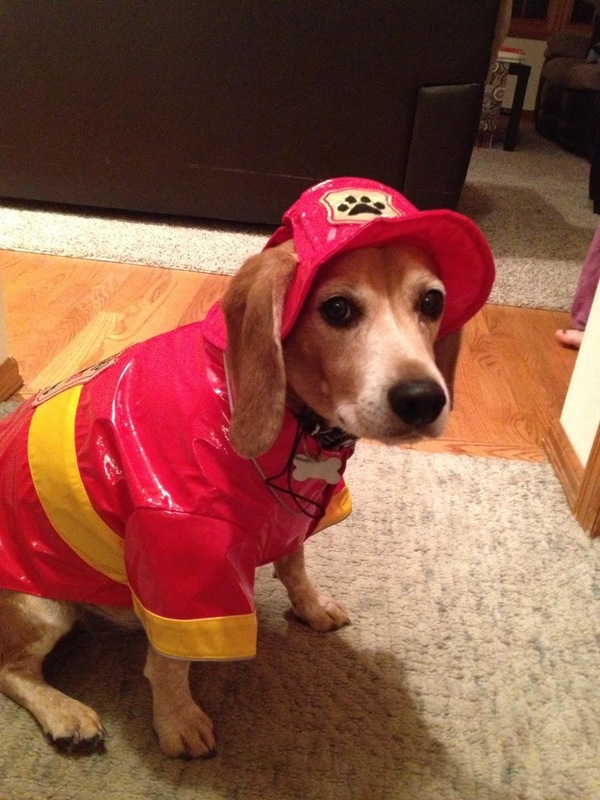 If you're a fan of jokes, check out this long list of Halloween One Liners! The scariest of the lot was definitely Ms Gracie! Miller and Paisley were Most Heroic! Can't beat comic-book heroes. Tazzie was Prettiest, and I think she had a really great hat too! A really big thanks to everyone that participated in the contest! The winners can pick up their prizes in the Fort Fido Lobby--congratulations guys! I hope that you have a spooky, fun day! P.S. Don't forget that you can always send in pictures of your pup to have them featured on the blog, contests notwithstanding. We love getting a peek at our pack back in their natural environments! Today we assessed the high spirited and very intelligent Copper. 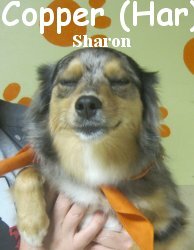 She is a two year old, nineteen pound, Miniature Australian Shepherd. Copper did quite well in our Little Roll where she was introduced to the pack. She exchanged "sniffs" with the other members and was generally curious about the whole situation. Further into her assessment, Copper, struck up play with Little Roll Rough-Rider, Pearl. The two really hit it off. It was great to see Copper get comfortable enough at The Fort, to have some fun on her first day. We look forward to visiting with Copper again and she is more than welcome to come to Fort Fido anytime. Nicely done Copper! For the costume contest that is lol! Get your friends to vote as well. You can cast your vote on Hope's Saturday Post. Here were the last two fabulous entries, click to enlarge. Reach for the sky, it's Sheriff Lucy! 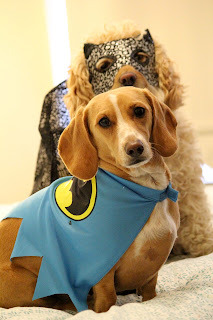 Here is some super cosplay, Miller & Paisley as Batman & Catwoman. I was never sure if those two DC characters were enemies or lovers hahaha. Also, I would like to say, "fantastic job" to all of our costume contest contestants. You all have marvelous dogs with fun and creative costumes. You made our day numerous times. Thank you! Staying with the spirit of Halloween, I'll end this post with some hilariously spooky links that I found and a clip, enjoy! 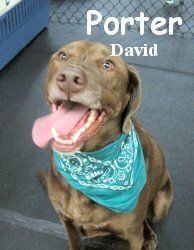 Other than a delicious adult beverage, Porter is the name of a cool and fun-loving, three-year-old Chocolate Lab that we got to meet at Fort Fido this morning! Porter had never been to daycare before, but he took to it well. He spent most of his time today getting the lay of the land, with a lot of tail-wagging and sniffing around. He'll be spending a few days with us, and I'm confident he will settle in with the pack. Speaking of spending a few days with us, pups Odin and Gracie have been doing just that and have become great close friends. Check out this clip from last night of the two having a romp around with Odin's little brother, Samwise. Odin and Gracie, sittin in a tree! In other news, it's time to get to the polls! Not for any political elections, but for the winners of Fort Fido's Howl-o-Ween costume contest (way more fun, lol). Check out this poll with photos of all our entrants. Voting closes on midnight on Halloween, winners will be announced that day. There are cool prizes for 1st, 2nd, and 3rd places so good luck to all our cool entrants. Click on the camera icon to switch to photo-viewing, and scroll through the pictures before choosing your favorite! 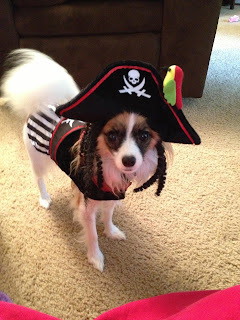 Fort Fido's First Howl-o-Ween Costume Contest! While our computer was out of commission, we had the chance to meet three great new pups who were all ready to play with us here at Fort Fido. First up were medium-sized guys Mac and Lucy, not only were these two great additions to the pack, but they were also fast friends with one another. The French Bulldog and Labradoodle were an adorable match. Manly Mister Mac is a daycare veteran, having attended at his home in Texas before coming out to our neck of the woods. 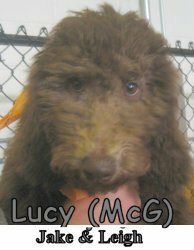 Lovely Little Lucy is only 16 weeks old, and is in the prime window for socialization and learning. 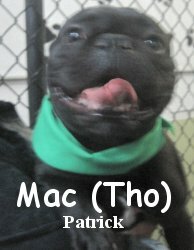 Mac's owner told us he loves puppies, and Mac definitely lived up to that! 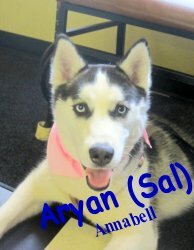 The third pooch we met was Adventurous Aryan, a feisty and fearless Husky girl. This high-energy and inquisitive pooch was a great large-roller, and you just can't help but be impressed by those icy-blue eyes. What a gorgeous girl! We look forward to seeing all these pups back soon! We are experiencing some technical difficulties at the moment, but make sure that you stay tuned for some great stories about new pups, Halloween Costume Contest prizes, and more direct from Fort Fido. Hopefully we will be back "on the air" by Thursday or Friday. Don't forget that the deadline for Photo Contest submissions is coming up, and then it will be time to vote for your favorite pooches! Enjoy these new entries from Buddy, Gus, Tazzie & Theodore. Click to enlarge. Well done gang! Again, fantastic job everybody, thank you for your entries, they have kept us grinning. Miss Sophia Loren 2--aka Sophie-- had her first playdate at Fort Fido today. 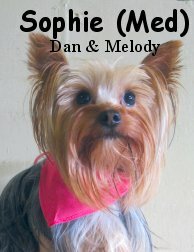 This spunky little Yorkie had a blast with the other small guys, and especially liked playing with Pearl and Dixie. These three were definitely peas in a pod! Check out this cute clip of Pearl and Sophie stuck in the spin cycle (what a super-cute game!). 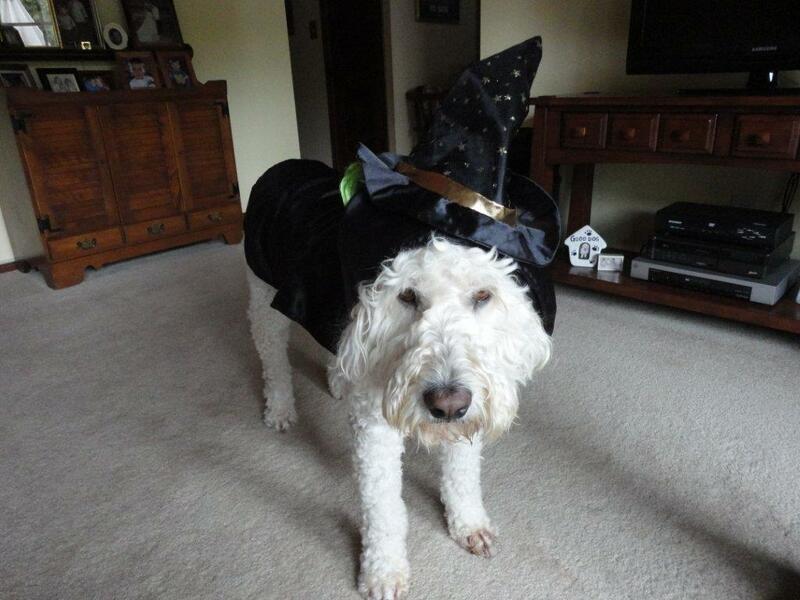 In other Fido News, Gracie has entered the costume contest dressed up as a spooky witch! The deadline for entries has been extended to Saturday the 27th, so there is still time to get your pooch in the running! Snap a photo and send it in! Jack and Cayenne had a great night at Ft Fido! Jack and Cayenne both spent the night with us, and have been really enjoying each others' company. Check out this clip of Jack, Cayenne, and Tikvah having a romp! In the big roll, talkative girl Juno wanted everyone to know just how much fun it was to play with Benny, a sweet Golden Retriever who takes everything in stride. Upstairs, ball time was as fun as usual--check out the usual suspects Marlee, Tigger, Buddy, Pearl, and Lucy all chasing it down! A mother dog and her puppies kept a lost boy with Down's Syndrome safe overnight, while he was lost in the woods. He was safely returned home after an 18-hour ordeal, dog and puppies right behind him. A pup in France has had an incredible run of luck-- poisoned, buried, and left for dead, a passerby happened to notice the ground moving oddly, and decided to get to the bottom of things. To his surprise, he dug up a little dog! The pup was rushed to a vet, who nursed him back to life. In a short 24 hours, there was massive improvement in his condition. The lethargic, dirty pup was replaced by an energetic little Jack Russel Terrier. A kayaker out for a day on the water rescued a dog from rocks during high tide. You don't often expect to see a Shih Tzu out at sea! This little guy was extremely lucky to have been found before the rocks were completely submerged beneath the tide. A fearful pup abandoned at a park was given a new leash on life when one man decided that he would do whatever it took to get this pup back to a safe life. Little did he know this pup could scale six-foot fences and run like the wind! Eventually, he got him home and gained his trust, and now the two are great friends. And don't forget to snap a photo of your pup all dressed up for trick-or-treating, and enter the Howl-o-Ween Costume Contest! The Brutus we met today isn't treacherous at all! 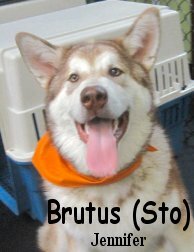 Though it may not look that way from his picture, big boy Brutus is still just a baby! At six months old and tipping the scales at nearly 100 pounds, Brutus is still learning about the world, even though he looks full-grown. This pup speaks good dog, and played with some of the highest-energy dogs in here--he gave zippy hound-dog Zipper a run for his money! This sweet pup is going to fit right in around here--I can't wait to see him all grown up. Good job Brutus! 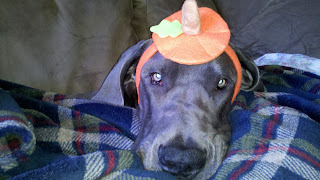 P.S.-- Don't forget that we are having a Halloween Costume Contest for the pups this year! Submit photos in person, via Facebook, or by email. Riley and Diego are already getting in on it--join these two cuties! 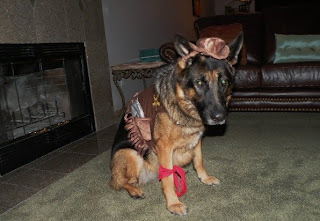 A hilarious friend of mine sent me in some photos of his dog and her Halloween costume. Hahaha, Beatrice is looking pretty darn funny in that horse mask. Thanks Greg! Rainier's pa, referred me to this amazing video and story yesterday: Brave Dog Rescues Companions From Canoe. This one is a must see folks, truly remarkable. Thank you Colin! Last but not least, I've had this little gem of a animated-gif bookmarked for some time... What an actor this dog is, he should get an academy award lol! Super photos as always, click to enlarge and enjoy! In the news, Kabang--a dog who lost her snout protecting two children from a motorcycle crash--has arrived at UC Davis to get life-saving treatment, and a new prosthetic snout. This was a long trip from Kabang's native Philippines! She is lucky to have so many people around the globe rallying for her, contributing to transportation and medical costs. This special soul definitely deserves her fame. A pair of London Street Artists have created a cool new art project-- dog jackets that were all individually made by various street artists around the globe. The art installment is called "For Dogs Sake," and all the pieces are for sale, with proceeds to benefit dog-friendly charities. When a pair of golden retrievers got lost in the woods at Cape Cod for two weeks, nobody really expected them to come back. When one returned after that length of time, his owner was glad to have found one of the animals, and did not expect what happened next. The pooch led her straight to the second dog, reuniting the entire family. What an amazing animal! This is a cool long article summing up the science behind what our dogs are thinking. Going from math to language, it shows a lot about what we have learned about the canine brain. For example, most dogs have a vocabulary of about 165 words, though some can learn up to 250. Dogs can read human gestures and body language better than chimpanzees (our closest cousins) can. A pup who was adopted from a shelter in Connecticut repaid his new family in an amazing way-- he alerted them to the fact that their nine-month-old child had stopped breathing in her sleep. With his prompting, his owners checked on the baby and were able to call paramedics and revive the little girl. In this radio program, NPR traces the origin of the phrase "the dog ate my homework." This is really funny! From the daycare today, I caught this great clip of tiny boy Kalohe romping with Bogie (who won't be bigger than the little Bulldog pup for long!). These two make a really cute pair. P.S.-- Here's some info on a pet food recall-- Nature's Recipe is instituting a voluntary recall of some of its products due to the possibility of salmonella contamination. If you use this brand, please check to make certain that you do not have any products from these production runs. Kumpi still has never needed to be subject to a recall--the rigorous testing of ingredients and final products (all held to human baking standards) ensures that this will remain a very unlikely scenario. In all actuality, two excellent new dogs started today. So the blog title should have read, Happy Harley and Renowned Rebar. However, I couldn't help what popped into my head when hearing those radically cool names hahaha! 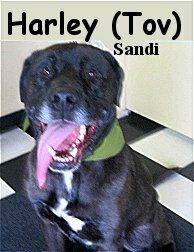 Checkout Harley, he is a four year old, ninety-five pound, black colored, Labrador Retriever / Mastiff Mix. 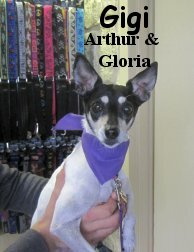 Harley is a very gregarious and happy dog that loves to play. He had a tremendous time in our Big Roll and played with any dog that was interested. We even snagged a nice clip of, Harley, playing "Tag" with rebel-rousers Jake and Juno, have a look. 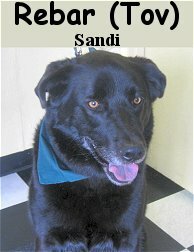 Now Rebar, Harley's "Brother from another mother", is a seven year old, eighty-five pound, black colored, Labrador Retriever / Collie Mix. Rebar is a sharp looking animal. He hung out in the Medium Roll and handled himself quite well, considering it was his first day and all. Rebar enjoyed being with the pack and ended up busting-out in play with One-eyed Marley. Harley and Rebar are both welcome to attend Fort Fido. May we see them again shortly... Just leave the choppers out back fellas. Have a nice weekend... It's back, doh! Stay dry! We had the good fortune to meet two sweet rescue girls this morning. 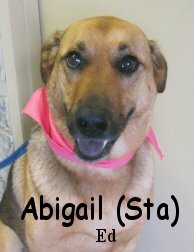 Abigail is a six-year-old Shepherd mix, and her sister Heidi is a twelve year old collie mix. 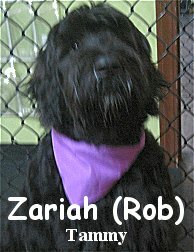 Abigail did well in the Medium Roll; she was sociable and attempted play with the irresistible and gregarious Marley. 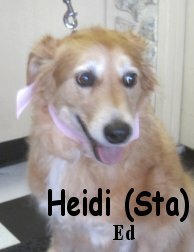 Heidi wasn't too sure what to make of all the little whipper-snappers' whipping and snapping, so she just kept it cool. This is a well-balanced and calm older gal, and it's a great contrast in energy with some of the wilder pups. I have found through my own observations that a pack does best when there is a wide variety of energy levels present. It means that no matter the mood, there's something to do. Whether neckfighting or chasing, snuggling or wrestling, different energy levels help to keep a pack balanced. In other news, we have officially launched Fort Fido's first Howl-o-ween costume contest! Take a photo of your pooch in their Halloween finest and submit it via email, post it to our Facebook wall, or bring a print in to the lobby. Submissions will be accepted until October 23rd. Voting will be open from October 24th through October 30th, and winners will be announced on Halloween. To make it a little more fun, there will be prizes for 1st, 2nd, and 3rd place! Put your best paw forward, and good luck in the contest! I hope to be receiving some great pictures from you all soon!